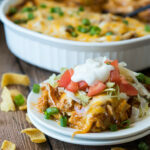 This cheesy Chicken Tamale Casserole is a quick and easy family weeknight dinner that has all the flavors of classic tamales without all the fuss! Preheat oven to 400 degrees F. Lightly spray a 9×13 inch casserole dish with non stick cooking spray, set aside. In a large bowl combine the corn muffin mix, cream-style corn, eggs, milk, chili powder, cumin and 1 cup of cheese. Stir till combined then pour into the casserole dish. Bake for 20 minutes. Remove from oven and use a knife to pierce the cornbread mixture several times all over. Pour the enchilada sauce all over the top of the casserole. Top with the shredded chicken and remaining cheese. Bake for an additional 20 minutes. Let cool for 10 minutes before slicing into pieces and serving with optional toppings. Enjoy! Substitute the shredded chicken for equal amounts shredded pork or beef if desired.